If you can't see the picture the verses are 1 Peter 4:8-11. And they are just wonderful. The first part gives such weight to love and how it covers a multitude of sins- so we need to LOVE, LOVE, LOVE each other. 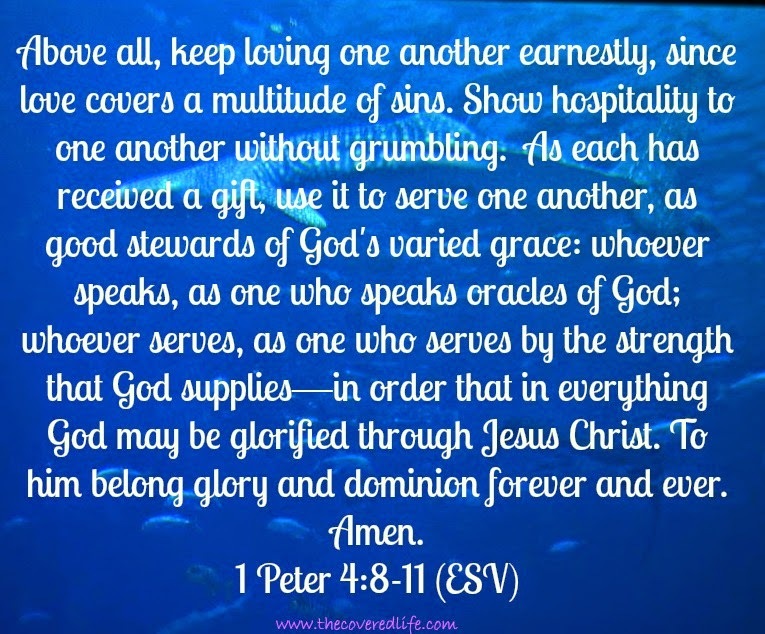 We are also to be hospitable without grumbling! Okay, I'm not going to repeat each verse, but just read each sentence and take a moment to let it sink in... Then make sure you really meditate on the last part- "In order that in EVERYTHING God may be GLORIFIED through Jesus Christ. To him belong glory and dominion forever and ever. Amen." The End. Done. Our life's purpose is to glorify God in everything we do. In every act of service. In every act of hospitality and in every act of love. It's not to us be the glory- to God be the Glory!